From suspenders with stripes to comfy tracksuits tucked into socks, Louis Tomlinson has explored a variety of fashion trends over the years. Ever since he stepped into the spotlight, Louis hasn’t been afraid to express himself with fashion. During the X Factor days Louis' outfits were quite unique. You would often see him walking around in a onesie or wearing Toms—a type of canvas slip on shoe—paired with baggy trousers or shorts. He was also very fond of lightweight scarves, a look that actually wasn’t on trend and unique to Louis. However, as the years have passed, Louis’ style has matured; although, his love for shoes has remained. Let’s have a look at five of our favourite iconic Louis looks! What’s not to love about this smart-casual outfit? Valstar are an Italian men’s clothing company that produce particularly sophisticated clothes and are known for their excellent choice of materials, with their suede jackets being the most popular must-have item. 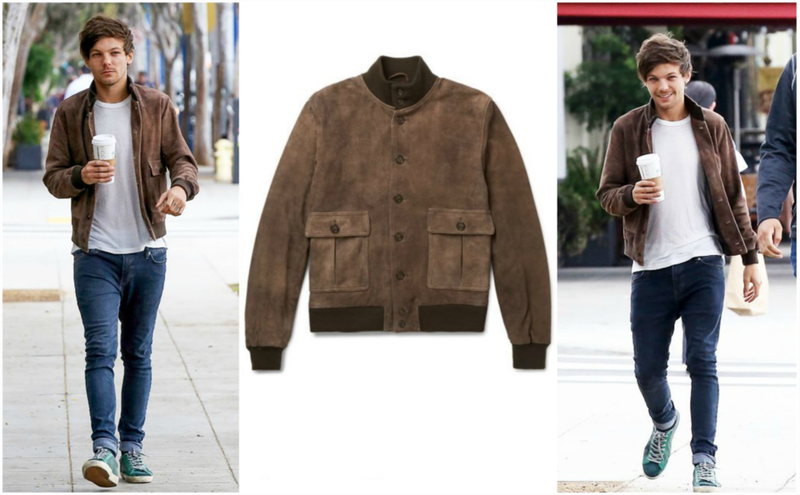 The washed out brown colour of this particular Valstar jacket creates a vintage look, but by pairing it with rolled up blue jeans and trainers, Louis keeps the overall look modern. The green trainers go surprisingly well with the outfit and keep Tomlinson looking casual. It’s a perfect look for grabbing coffee while also showcasing Louis’ knowledge of fashion. It’s not often that we see Louis in black ripped jeans, but he totally rocks it! The matte black leather of the Paul Smith trainers are subtle but really do top off the whole look and deliver a unique, edgy style. Paul Smith's designs combine tradition and modernity and stand somewhere between high fashion and formal wear. Louis has chosen to pair these trainer with a bomber jacket by the world famous brand Dolce & Gabbana that, like Valstar, are another Italian brand who create luxury high-end clothing. The white details in the jacket (inside and out) add flare to the jacket and match well with Louis's choice of a white t-shirt underneath. Overall, this outfit unmasks yet another unique view of Louis’s fashion sense. Would this article be complete without Louis in denim? It’s truly amazing how he can go from looking grunge (as in the previous look) to looking adorable in this versatile Levi Sherpa denim jacket. He can literally pull off ANY look, which is why Tommo’s fashion choices are interesting to explore: they are all so diametrical. You may have heard of the denim brand Levi; it was founded in California and has since opened up shops around the world with high quality denim clothes ranging from jackets and jeans to accessories. Louis has gone with the jacket here and paired it with a dark t shirt, jeans and what looks like a blue open-shirt. His choice of so much darkness puts a lot more emphasis on the blue. All together, this outfit brings out a more softer side to Louis and his style. 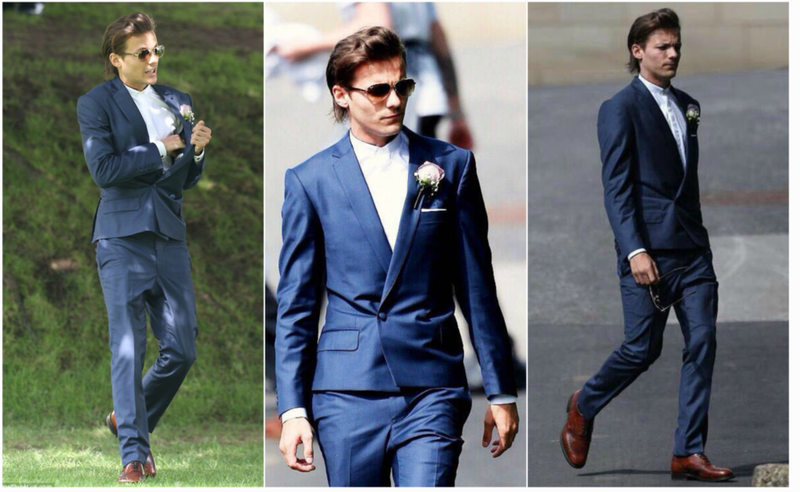 For our fourth look, let’s throw it back to Johannah and Dan’s wedding where Louis wore this gorgeous navy suit. There’s no denying that we love seeing Louis all made-up at important events. Pairing his suit with a high collared, white button-down shirt keeps the look chic and sharp. While the brown shoes are a twist to the popular choice of black, contrasting very well against the unique blue color. Louis doesn’t often wears aviator sunglasses, but they really do top off this whole look, making him look especially trendy. Last but not least, we have Louis in what could possibly be his most worn style of outfit, especially recently. 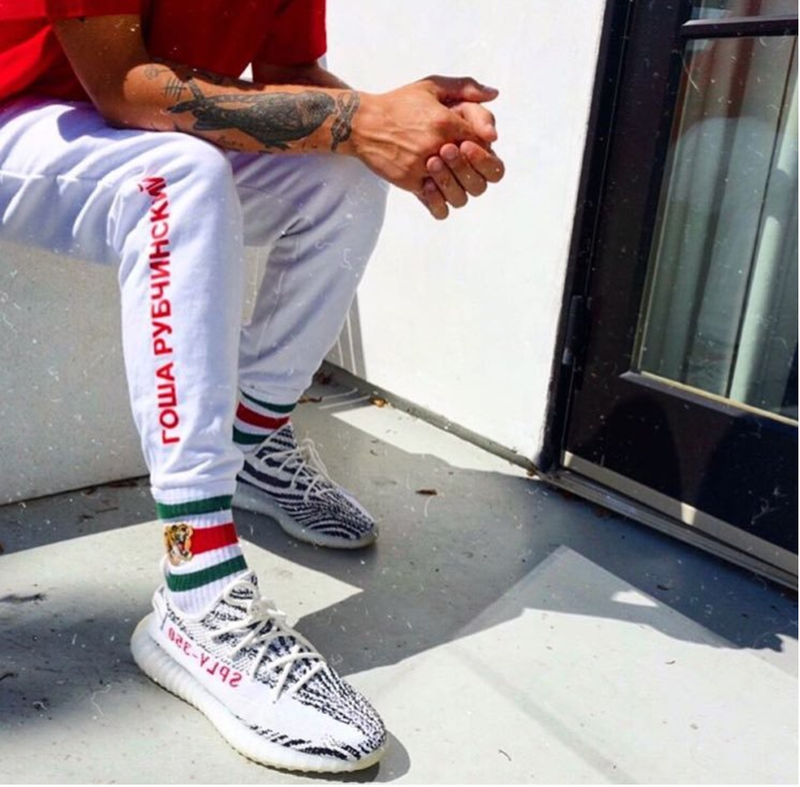 It’s not unknown to us that Tomlinson loves his street style and this is a good example of his typical tracksuit paired with some white and grey Puma trainers. Puma are a German footwear brand who create sport-inspired products, however there is definitely something for everyone whether you are a sports fan or not. Tracksuit bottoms tucked into socks make a common occurrence in these casual looks. The only question is; Are they tucked in for comfort, style, warmth or because the bottoms are just too long? Overall, it’s clearly a look of comfort, but somehow Louis makes it look fit for a famous runway show. It's noticeable that Louis’ style has changed over the years and even now, we are witnessing new looks day to day. While these are only five of Louis’ looks, he never fails to look great in any outfit choice. It's fair to say that we are very much looking forward to seeing what fashion choices Louis has to offer in the future.